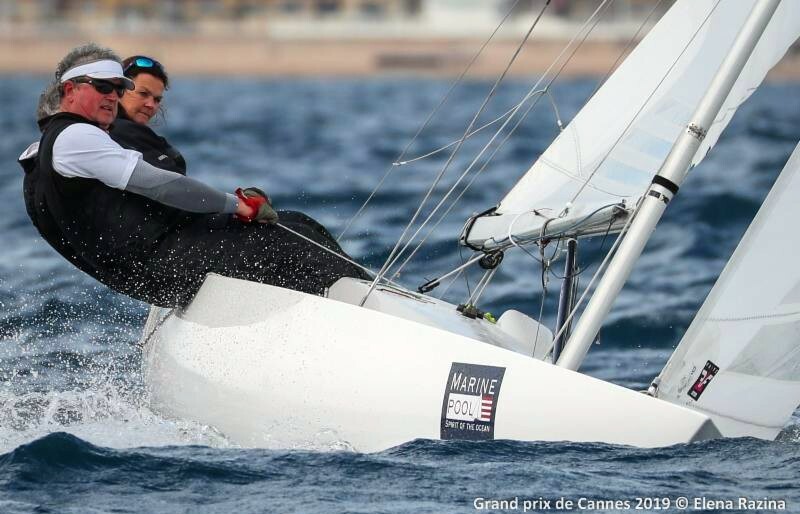 German 470 World Champion Tanja Jacobsohn takes top of the leaderboard after the opening day of the Dragon Grand Prix de Cannes on the Cote d’Azure, France. Tanja Jacobsohn sailing with Bernard Jacobsohn and Jan Schareffesser showed the 50 strong fleet how it’s done with some wonderfully consistent sailing. Jacobsohn (3,2) has a three point lead ahead of Britain’s Grant Gordan, with Thomas Muller of Germany in third, tied on points with Marcus Bennecke of Germany. Germany’s Marcus Brennecke is in fourth place counting ten points with Heerema slotting into fifth on eleven points. Gordan sailing with Scott Ruairdidh, James Williamson and Alex Warren took the first race with Holland’s Pieter Heerema with Lars Hendriksen and George Leonchuk, taking race two. This first event of the Dragon European Cup 2019 has attracted an extremely strong field from 16 nations across Europe and as far afield as Japan. Racing continues until Friday 5 April with a total of 8 races scheduled.